I know you were so eagerly waiting for this update.I always kept ma promises :D.
Due to high number of requests for this mod, I decided to create this mod and now its taken birth to excite you. So today, no more gibberish talks as I am already tired creating this mod and made it compatible with all devices. I have programmed this android app, which is just around 270kb.You don't have to uninstall the main Mini Militia game or bother with its data. 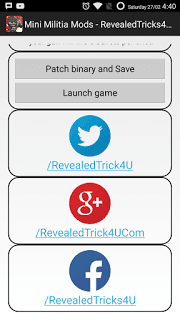 Steps - How to install and use the app without even bothering with the main Mini Militia game binary or its data. Download the app from the "Downloads" section below. The above picture shows the different options which you can enable or disable as your wish.The options are self explained for new comers to this game.  (I don't have to do battle with the comment box to explain things :P).So just select what ever options you want. After selecting your desired options, just press the button "Patch binary and Save". If it shows patch successful message, then you are good to go. After it shows patch successful message, MAKE SURE THAT SELECTED TICK BOXES ARE STILL SELECTED.If it is still selected, then the patches were applied successfully. Speechless?.Ah come on, you are good to go.Jump in game by pressing the button "Launch game". Toggle Mod LIVE Combo v40.0 - This is outdated, please find the latest version of this app by clicking this link. Fixed a typo in an alert box. 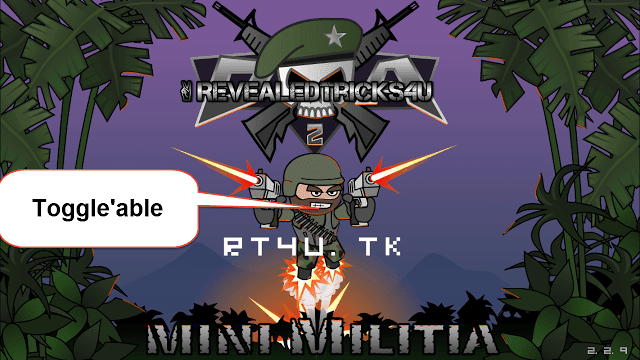 That's all guys,Please share and subscribe to show me your love :D.
"Unfortunately, Mini Militia ReavealedTricks4U.com has stopped. It seems you are using MIUI as your phone's custom ROM. Please consider reading the first part of the post as I have updated the post. Just uninstall the previous version of the toggle app and download the app once again(its updated) from the Downloads section.After downloading, just install it in your phone and open it. After the app crashes, just use your file manager and go to your phone memory and see folder name "rt4u" and zip that folder and send it to my email "[email protected]". So I can evaluate what makes the problem in your device. Use ES File Explorer as your file manager.And more importantly, make sure you've got root access. Thanks for sending the logs. The bug has been fixed, you won't face crashes anymore.Please download the updated version from the downloads section. It's me who have to be thankful to you for solving my problem. Your togglable version is nice app.. But its not working for me.. I have rooted device and custom rom..
After i click ' patch binary and save ". In the togglable mod.. I've just analysed the memory logs. Ohh sorry shihab bro... After i click " patch binary and save " it shows patch successfully..
And i hit launch the game. After it shows the Patch successful message, does those selected check boxes are still selected?. Make sure you are using the version 2.2.15 Mini militia binary. Just uninstall everything, then install the original Mini militia apk and then download the updated version(updated seconds ago) from the Downloads section, then install it. Delete the rt4u folder and start the app once again, and select things you want and Patch and try pressing Launch game.If the game still crashes, then send me the rt4u folder.Once again, delete the rt4u folder before launching the newly installed mod app. I might not help you with just the log files. For example, If you've selected the check boxes Gravity and Unlimited Bullets and press the "Patch binary" button and it shows the message Successfully. Does those check boxes still selected or unticked? 2. Is there a way to replace the health reduce amount? ( like is there a way to become more resistive to grenades and bullets? fo eg: if we are getting killed by 5 bullets of handgun, is it possible to die when we are hit by like 15 bullets of it? ( because if i enabled health hack friends in lan wifi are able to know that I am using some kind of hack as i am not dying for once also in every game. SORRY BRO THE MESSAGE WAS TOO LONG AND I APOLOGIZE FOR IT. Thanks in advance. Its ma pleasure to help you out.I am eagerly waiting for each and every comments from ma lovely followers and visitors. It seems you've got some knowledge in assembly language, and I appreciate that. 1)As you said, I could've simply made the code to "mov" a specific value into the memory register, so that the values won't change.For the sake of simplicity, I have just moved the content of R7 register(Has random higher values, anytime) and stored it into the memory location.There are codes rooted into the long procedure, still changes and detects if I've specified a constant value like #FF(255) with SUBS or ADDS and it results in NO AMMO or always LOW AMMO, sometimes high game crashes too. (I've to spend some more time to patch all the blocking codes, even though its a little complicated). 2)Mini Militia got a global function(I can't reveal the function name, sorry) which handles all the damage caused to the Human type objects such as your character or Humanoid robots.It was a bit complicated(highly obfuscated) to find out the memory address and code where the memory address gets written, when any damages takes place. (For the sake of simplicity, I've just replaced some assembly codes with some NOP's(No Operations) and with some random value moving code(Can't explain more, got some highly technical words, that may confuse you). And you don't have to apologize for the long comments, I love to know and share knowledge.The comment box is all yours :). Take care, buddy.Once again thanks for taking your time to clear your doubts with me. Thanks bro for the blazingly fast reply as always. Thankyou for clarifying those doubts. And am i the only one who gets all the other players struck in multiplayer game after a minute or so?. Like everyone else in the game freezes except me and I cant even kill them. 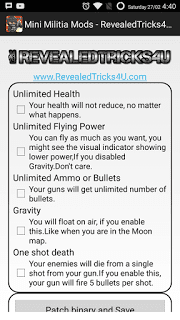 As you can see in my game play video http://www.revealedtricks4u.com/2016/02/updated-mini-militia-v2.2.15-unlimited-health-flying-ammo-oneshotdead-multiplayer-android.html. Never switch weapons and unfortunately you can't drop bombs too.It may freeze your game, if you are playing in a Quick play mode.Just follow the instructions as I did in the video. No problem happens when you play in Lan Wifi mode, even if you drop bombs, does'nt matters. Your game may freeze even though you are following my instructions, but its rare case.May happens 1 or 2 in 100 times. I can speak little malayalam..
" unfortunately app has stopped " enna kuripp varunnu.. Tikk cheyyunnathinn mumb mini militia work cheyyunudhayirunnu. Enikk thangale budimuttikkunath ishtamilla.. Engilum if u dont mind , enikk 'unlimited health' ozhivaaki oru lib file undhakki tharumo ? ( oru vazhi illengil mathram ). If you are getting FC's when opening Mini Militia, try clearing the Data by app settings. I am asking the question 3rd time, after pressing the Patch binary button, the previous selected options are still selected or all just got unticked? I prefer you to take 2 screenshots like before pressing Patch binary and after the successful message.And please send it to me. Iam really sorry for not reply what asked 3 times..
√√√√ yes still selected .. Again i reopen this mod .i can see still selected what i selected before.. Sorry I couldn't speak that language.I wanna be helpful for other people who does'nt know the language, might face the same issue as you got.So they may fix it by reading our comments. If the selection are there, then the app's binary is successfully patched and saved.Try clearing the Mini Militia data and relaunch the app after patching it. I think you are encountering with a strange problem in your specific device. Sorry for the slight delay, I need to make a hands-on check on your device. If you feel comfortable, then please install the Teamviewer quick support and send me the ID through the contact page. DDidn't understand.. Ithengilum malayalathil parayamo ? I got your teamviewer ID, but please be active on your phone.I mean turn the Internet connection on and I may connect to you anytime. Please send me a message through contact page around 8 PM, Indian standard time GMT 5:30+.I can help you at that time as I am a bit busy now. I will wait at 8 oclock. And till howmuch time will i have to wait for u in that teamviewer ..
You gonna surprise for sure as I am gonna release a newer version of this app with cool new features like no freeze or no crashes, even when you switch weapons or throw grenades.Rest is secret :D.
Stay tuned, I might finish coding it by tomorrow and update you guys.Don't forget to subscribe to get the update, right onto your mailbox. Guys, Am getting a mild heart attack :D.
You guys just over praising me, anyways. Just wait for 1 or 2 hours more and get yourself excited with suprises. It will be rolled out soon. Its a bit complicated as the next update got wonderful features, you may not ever thought of. That problem will be fixed in the next update, that will be released soon. It won't work without rooted device, but you could find the modded apk which doesn't requires root, just by searching this website with text "mini militia"
i need a modded apk please, my phone is xiaomi Redmi 1s, everytime i play multiplayer, players freezes and il wait till the time runs out...thnx in adv...can share me the link? Please upgrade to the latest version of the game v2.2.16 and update the toggle app to v3.4. bro it showing plz root the phone after rooting already . Make sure these steps has been followed. 1)Make sure you've successfully rooted your device by using Root checker app. 2)Most importantly, whenever the mod app asks you to get root permission, you have to press Grant, else the app will fail saying "Not rooted". my Sony xperia tipo grand rooted device. 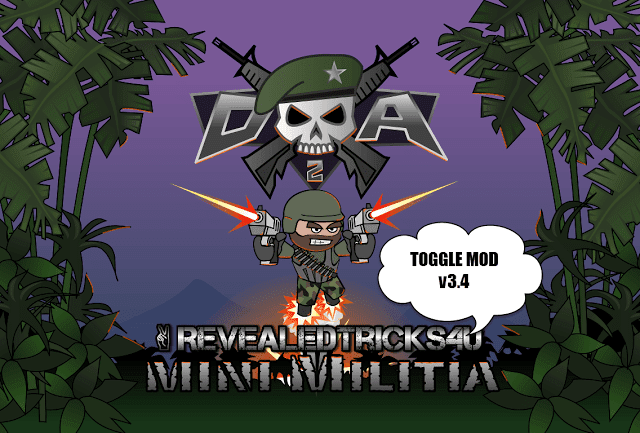 toggle mod mini militia mod can't work.